Food Review: Burger Bach | Food and Drink | Style Weekly - Richmond, VA local news, arts, and events. How to get a juicy, sauced-up New Zealand burger in Carytown. Owner Michael Ripp says the health benefits of New Zealand beef make his Carytown business a conscious move. 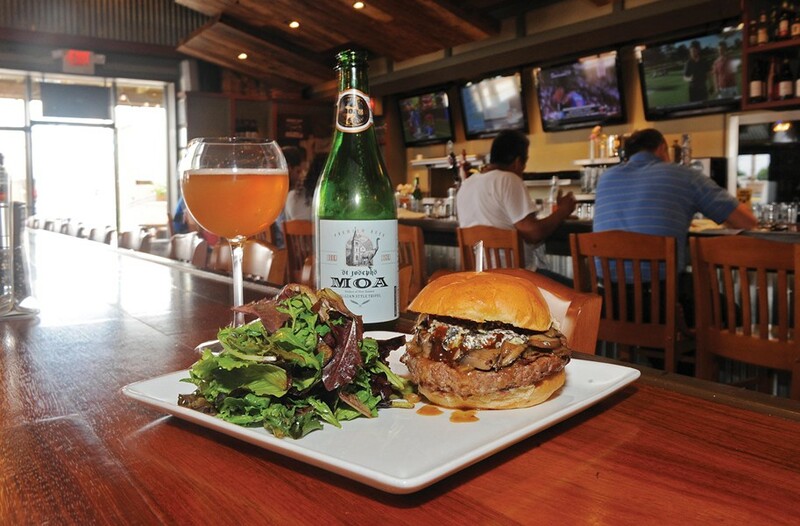 Here, the Wellington burger is loaded with mushrooms, onions and New Zealand blue cheese; the beer is a Moa St. Joseph’s tripel, also from New Zealand. If the set-into-brick cow on the back wall doesn't show off the earnestness of the restaurant's owners, the large and laminated menu does. It states no substitutions; burgers come two ways — pink or not pink. This is a place that takes meat seriously. Burger Bach (pronounced "batch" as in bachelor's pad), the new Carytown burger spot, isn't playing around. Flying meat halfway across the world is no joke. Neither, apparently, is sauce. Everything is served with or can be served with multiple sauces. Burgers, fries and seafood all are plated in myriad saucy ways. Burger Bach's interior is attractive but no-nonsense. Wooden booths line every available wall and a long communal table sits dead center, allowing people to face the four side-by-side flat screens or, with backs to the screens, ignore them. Popping through an open kitchen window are sporadic views of a perpetually busy kitchen staff. An extensive list of Australian and New Zealand wine smacks of someone who did their research. Fourteen "burgers" make up the better part of the food offerings, from basic beef to free-range chicken and a house-made vegetarian choice. It isn't surprising that the basics burger ($7) is a smack-you-in-the-face standout patty sandwich. Ordered pink, that's how it shows up. The sturdy 6-ouncer is juicy and flavorful if a little messy, but burger juice isn't a bad thing. The appropriately named hangover cure ($11) is a behemoth with toppings of fried egg, uncured bacon, American cheese, sautéed onions, green chili sauce, hot sauce, tomato and mayonnaise. Beneath all that is a darn good burger. The West Coast burger ($10) is equally over-sauced. The bite of organic cheddar and the sweetness of caramelized onions are hidden by a heavy dousing of roasted jalapeño rémoulade. Twelve different sauces, all made on-site, are available with familiar tasting fries. Among the many condiments, the fresh and bright cilantro sauce stands out as something different. The roasted onion sauce coating a crisp french fry is a twisted take on chips and dip. Happy hour is the best time to take advantage of the seafood options. From 4-6 p.m. daily, half-price mussels, oysters and shrimp are ladled up in no fewer than five different ways. Fresh New Zealand mussels are the money shot then at six for $6. If Prince Edward Island mussels are the size of dinner mints, then New Zealand mussels are the size of small dinner rolls. Fat, delicate and deep coral in color, they take nuance from the broth in which they're served. Spicy 6 for $12, appropriately titled, is a shock to the taste buds with fresh jalapeños and chipotle cream sauce. All this sauce and seriousness doesn't come cheap. Burgers range from $7-$11 and each extra item is in fact extra, even lettuce and tomato at $1 each. Cheese is an added $2. Need more ketchup? That's also a dollar.